Mass Effect Month, Day 3: What’s your favorite class to play? Your second-favorite? Infiltrator. If I have the option to play as a stealth/rogue/ranged character, I’ll take it. I prefer a little more time to plan out what I want to do, and so finding a perch and commanding the field from above is something that I enjoy. Some call it cowardly, but I say that the enemies are just as dead and the objective is just as achieved. So… I guess if I’m not going to snipe the guy from a mile away, I’m not above charging in and bopping him/her on the head until they fall down. My friend always teases me, ever since we both played Dragon Age: Origins and I played as a Dalish elf. She said she could totally see me as an “elf-type”, and so when I played Mass Effect and told her I was a sniper, she said that of course I was, because that was as close to an elf that I could be. Hey, you can’t hate a woman for having a type, right? What class do you play as most often in an RPG (it doesn’t have to be Mass Effect)? What is your second-choice class? What do you like about them? Let me know in the comments! I always favoured the Vanguard class. I always lean toward hybrid classes that have the best of both worlds, like magic and straight up physical combat. I loved using my biotics to levitate enemies and mow them down as they helplessly float in the air. When I replay the series, I see myself doing the exact same class because it was just so much damn fun. My friend played as a vanguard and she loved it. I’m so bad at almost anything that requires magic that I’m always amazed when people show proficiency in a class that requires it haha. I normally play classes that are either stealthy or magical based, which is kind of weird that in the Mass Effect series I always went for the Soldier class. I guess I wanted a change of pace and change of my play style. You’re better than me. The fail is strong when I try to play as any sort of mage-type character…. Infiltrator, though, is a different story… haha. That’s cool, though. Did you like the change of pace? I enjoy mixing it up in ME1 but the absurd weapon restrictions in ME2 mean I usually favour soldiers for full trilogy runs. 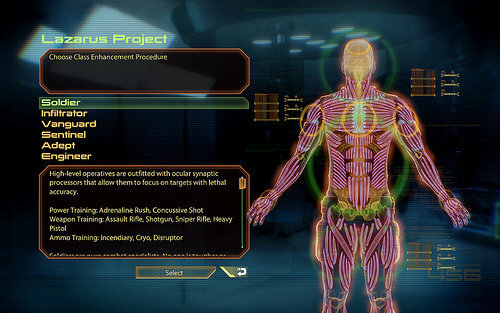 In ME1, every one has training with a pistol (but can still use every weapon) and combat classes have access to more, and you can take bonus training skills on a second-playthrough. In ME2, infiltrators apparently received weapons training in machine pistols but lost their knowledge of standard pistols, never mind that I usually select assault rifle training for them in ME1. In ME3, I think it’s rewarding to play as a Vanguard and similar classes in multiplayer. I also don’t like class-switching between games (it breaks my immersion, especially when it’s between biotic and non-biotic classes). Very cool! I always enjoy hearing about how other people play these games! My primary runthrough was with an infiltrator the whole way through. I never made much use of the stealth features, but the sniper rifle and tech powers got a lot of play with me. Beyond that, was big into Vanguards as well. Which, I guess I go to the extremes of distance as well. Either from a long way away, or with the class that’s constantly charging into people’s faces with shotguns and short-range biotics. I don’t know if I have a favorite class generally in RPGs, but I guess my preferential order would be (1) ranged class, (2) melee class, (3) magic class. In Mass Effect, I like all three of mixed classes. I lean towards Infiltrator because of the sniper rifles, but then I barely make use of the class’s stealth options. In the first playthrough of all three games I ever did with the same character, I played as a Vanguard. But again, I primarily found myself shooting things rather than making use of my biotics. In Shepard’s trilogy I rocked the Soldier class and loved it. My Shepard seemed like the type! Guns blazing is always my preferred play style. In Andromeda, I went more Vanguard with Ellen Ryder (loved the class freedom in that game thanks to SAM). The biotic powers in Andromeda were so much fun to use, but I still wanted to bash things up close. I did essentially play as everything briefly for trophy reasons though. My 2nd Ryder on Insanity difficulty was a Master Engineer. Sending things to fight for me while I hide for the win!! Now that is a cowardly play style, haha.